We’ve been eating lots of fish around here lately. I keep wanting salmon, but all we keep finding is farmed Atlantic salmon, and that’s just a no-go since we’ve been spoiled by wild Pacific Northwest salmon. So Pacific cod and farmed tilapia have been on the menu instead. While unsuccessfully trying to track down a recipe for Greek lamb chops (the very same I just wrote about the other day) in my Food and Wine of Greece cookbook, I instead came across psari plaki, a baked fish recipe first called to my attention by Barbara of Tigers and Strawberries. I was intrigued and decided to give it a go, with a few adjustments for what I had on hand, namely half an onion, some scallions, and canned tomatoes. It was pretty tasty, but I am still tempted to try Barbara’s variation, which calls for slices of lemon and appeared to pack a bigger punch flavor-wise. I served it with some garlic-olive oil couscous, tossing a handful or two of torn baby spinach leaves into that as it steamed, as a way to sneak a few more veggies into the meal. I pretty much followed the recipe this time, though I made sure to really oil my skillet because I know how delicate fish can stick to the stainless. 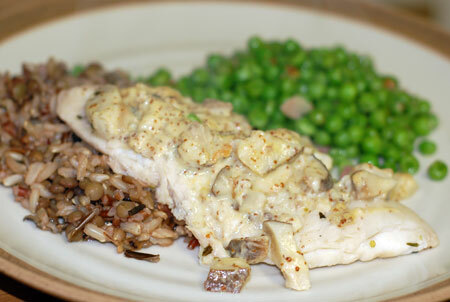 I used rehydrated chopped mushrooms for convenience, and whole grain mustard because I just like it better. It made the most sense to me to finish cooking the tilapia—which didn’t take long at all—and remove it before adding the broth and mushrooms to start the sauce, so that’s what I did. This sauce could certainly be used with chicken also, or even pork, I would imagine. We still had like 2 pounds of fish to eat up after that, and of all things, Jeremy requested fish sticks for dinner the next night. I based mine on a straightforward recipe from Eating Well. I must admit we ate slightly less “well,” however, because I used fresh pugliese bread crumbs instead of whole wheat ones and omitted the whole wheat cereal flakes. I dredged them in whole wheat flour, at least. I also used my own blend of spices, but no longer recall what all I threw in. Remember, as you’re dredging, to keep one hand for dry operations and one for wet—it cuts down on the need to scrub gooey crumb build-up from your fingers! 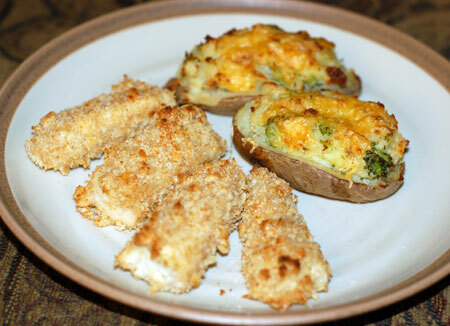 To go with the fish sticks, I microwaved some small russets and made twice-baked potatoes with bacon, cheddar and broccoli. They went in the oven just before the fish and completed our finger-food dinner nicely, especially since they served as a vehicle for vegetables. Preheat oven to 450°F. Set a wire rack on a baking sheet; coat well with cooking spray. Place breadcrumbs, cereal flakes, lemon pepper, garlic powder, paprika and salt in a food processor or blender and process until finely ground. Transfer to a shallow dish. Source: Loosely adapted from Eating Well. 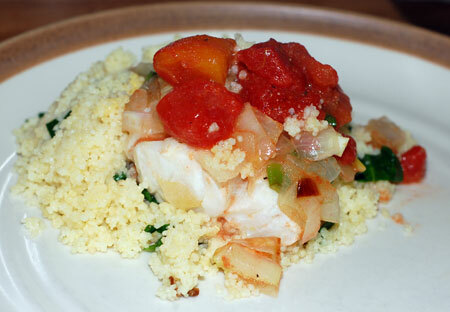 I have been craving fish a lot lately, but my husband keeps vetoing it from the menu. 🙁 These both sound good to me! Deborah, I’m sorry your hubby keeps vetoing fish. Mine keeps bringing home the same sorts over and over, so I am struggling to keep it from getting boring. I don’t have much of a fish repertoire yet. We finally found some decent wild salmon, though, so that will be my next post.